Whatever your catering needs, Cioffi's has you covered. We have Antipasto Platters, Gourmet Italian Gift Baskets, Italian Cookie Platters or Pastry Platters, Delicious Hot Dishes and much much more. 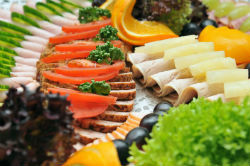 You can click our Menu tab above to view our catering menu or give Jerry or Joey a call for more details - 973 467 5538.